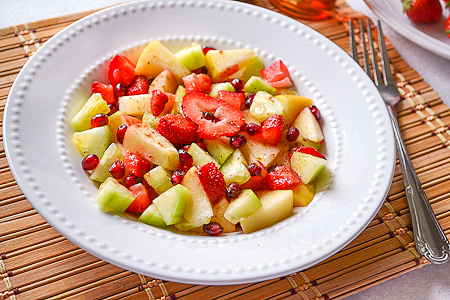 Today's recipe is healthy fruit salad with home made ginger honey dressing. Winter is the season where we and the kids are more prone to Cold and Flu. Because of recurring infection our body loses its natural immune power. So its very important to keep our self Fit and Active. Generally i have the habit of taking one apple or at least half apple n one banana in regular basis without fail. But sometimes due to sever cold or sore throat i hate or i wont eat fruits. Fruits are most essential part of our daily diet which supplies all necessary vitamins, minerals, calcium etc. So its very important to take at least an apple n a banana daily. Its very compulsory for my kids and i gave them daily without fail. But they won't eat anything including fruits when they are affected by cold n flu. Even i hate to eat any kind of food and even fruits also. I know my grand mom used to treat us with ginger dipped in honey and ask use to chew the small ginger pieces to cure sore throat. I used that formula here n made this healthy and delicious fruit salad. Try this, really it heals your throat pain. Strong ginger flavor open your nasal blocks also. Definitely you will feel refreshed n love to eat fruits even in sever cold. Extreme chill weather also makes our body heat and leads to common cold/sore throat/fever etc. So its good to eat cucumber and other fiber rich fruits. Now to the recipe..
Take a small bowl, add crushed ginger, honey, lime juice and water. Combine everything well and set aside for at least 30-40 minutes.I leave it for 1 hour. After that, again stir everything well and filter it using tea filter and keep the dressing ready. Then wash and cut fruits to desired shape and sizes. Take a bowl, add cut fruits and add the dressing and toss well. Trasnfer to a sald plate, sprinkle pepper powder n fruit seasoning . Beautiful presentation...so tempting n healthy!! Super colourful salad, especially love that ginger honey dressing.. Colorful n healthy recipe..looks yummy! Really healthy and easy recipe...Thanks for sharing. Salad looks healthy and tasty Sangee. Perfect way to enjoy Fruits for the winter. Thanks for linking it to the event Sangee. Very colorful and delicious Salad. Lovely click. what a colourful n healthy salad!! Very colorful..loved the pic! !Honey and ginger~nice combo. Lovely & healthy salad ! !